Feature Manipulation Engine (FME) is an optional module that can be included with MakaiPlan. The FME module provides the ability to import more GIS database formats directly into MakaiPlan through the seamless integration of Safe Software’s FME Spacial Data Transformation Platform. This flexible and powerful tool makes it easy for planners to translate, transform, and integrate spatial data in over 150 different GIS formats. These include proprietary data types, such as ESRI ArcInfo, Autodesk AutoCAD, and many other nonproprietary data formats, such as the International Hydrographic Organization S-57 standard for navigation charts. This tool simplifies and streamlines the integration of disparate datasets into the planning process, saving cable planners time and effort. 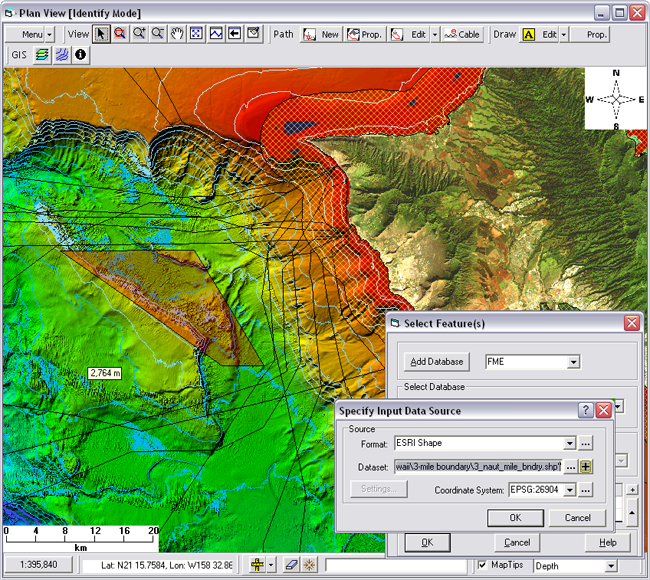 The primary data type that the FME module provides to users of Makai software is vector data. Makai has also added the capability to load DBDB-V data (a bathymetric data format used by the Naval Oceanographic Office) using the Makai DTM module. MakaiPlan comes with the optional FME module, which can import over 150 GIS data types, such as ESRI shape files as shown here. A table containing a list of formats (read and/or write) supported by FME Desktop (Professional Edition), and additional information on the attributes of specific data types can be found at Safe Software’s website (Safe Software Format Search). Please note that some formats may require a plugin at an additional cost.